Legends Paintball Field is an outdoor paintball field located near The Woodlands, Houston, Panorama Village and Willis in Conroe, Texas. 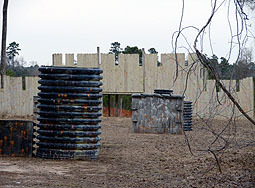 Legends Paintball Field is also convenient to Oak Ridge North and other cities north of Houston Texas. See the chart below for distances and drive times to other cities and points of interest. 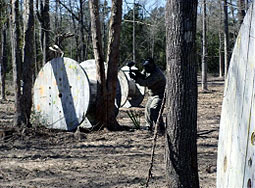 Legends Paintball Field is one of the closest paintball fields to the woodlands Texas. It was started and continues to be run by a Thao ( the father) Justin (the son). They bring a great attitude and perspective to create a unique and fun field for the whole family. 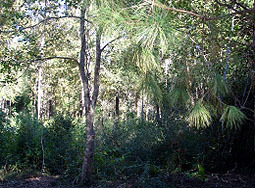 Legends Paintball Field is located on 10 acres of rolling wooded fields with some clearing for Air bunkers. This location consists of 5 courses. 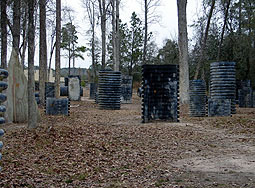 Legends Paintball Field also features a variety of other castles and spools. You'll find a 7 man airball field and a brushy field not unlike a jungle. 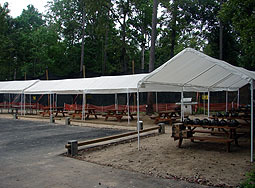 There are also areas with picnic tables and shelters for your group to rest and relax between games. 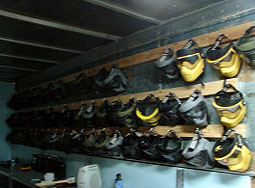 Legends Paintball Field features a more than 100 sets of rental gear that they rent out every weekend. There is plenty of gear as you can see above but reservations are still required. 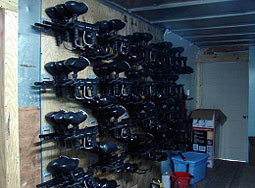 The gear is held to the highest standers and will satisfy your groups needs to a T.
The lights at Legends Paintball Field lends itself to several interesting types of games and a wider variety of play options. 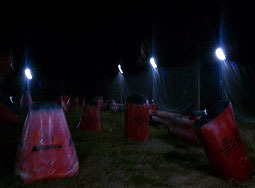 When others must go home because there is no light this field can continue on playing paintball. There are air bunkers and spool bunkers available on two different courses. Night play is as with everything else subject to availability. Please double check to make sure that the date and time you are looking for is truly available. 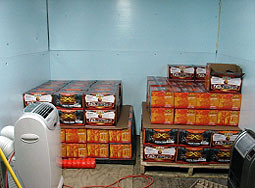 Legends Paintball field takes great pride to offer the highest quality paintballs for the participants to use. 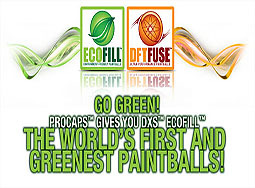 The Procaps (tm) DXS (tm) ECOFILL(tm) paintballs used alow for players to best use there equipment with the highest level of confidence that the paintball will perform appropriately. The take great measures to ensure that their paintballs are fresh and round. You will find no better paint at no better field. The parking lot allows for large groups to gather ad ready for their day. The Castle at Legends Paintball Field lends itself to several interesting types of games. You can see that they have interesting types of bunkers and field types for all skill levels. You will love the variety of courses at this field. 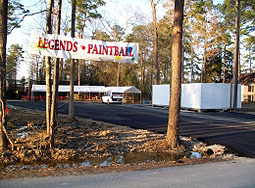 Legends Paintball Field is a "Field Paint Only" paintball field (FPO). This means that only paintballs purchased from Legends Paintball Field on the day of play may be used at Legends Paintball Field. For your safety and the safety of others, the consumption of alcohol or other drugs that may impair your judgment or coordination is not allowed before or during your visit. Do not bring alcohol onto the premises. 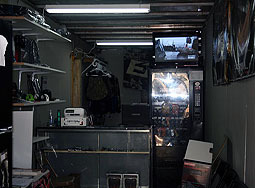 Legends Paintball Field reserves the right to eject any player(s) without refund that its employees think may be impaired or bring alcohol or other drugs onto the premises. 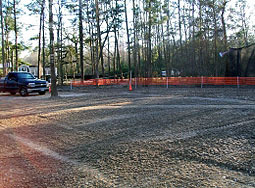 Legends Paintball Field is ideally located for people living or traveling in The Woodlands, Texas.